Apple has been granted two more patents in 2011 related to portable devices powered by solar panels. The first was in Jan 2011 and the second was granted in Aug 2011. For a long time, Apple have seen the potential for solar charging of small battery powered devices such as phones, PDAs, digital cameras, media players, etc. and have developed the plug and play theme to provide an intelligent interface so that they can build a patent portfolio in this competitive area. Both patents can be traced back to the same priority date of 6th Oct 2006. 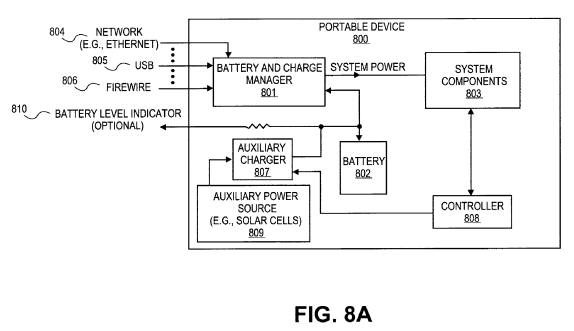 The first patent US7868582 is based around the solar power package for use with the portable device and claim 1 specifies the plug and play manner in which the solar power charger adjusts the amount of power provided to the portable electronic device based on attributes of the portable electronic device. There are three groups of claims (1-7; 8-14; and 15-21). The first group relates to a solar power package, the second group relates to the method of providing power from the solar power package and the third group relates to a power package which uses a solar power charger with an auxiliary battery to provide power to a portable device. 1. A solar power package for use with an electronic device, the package comprising: at least one solar cell operable to derive solar power from solar energy; and a power charger operable to provide the derived solar power to the portable electronic device, wherein the derived solar power is provided in a plug-and-play fashion when the portable electronic device is coupled to the package, and wherein the power charge is operative to adjust the amount of power provided to the portable electronic device based on attributes of the portable electronic device. 2. The solar power package of claim 1, wherein the power charger is further operable to provide the derived solar power to the portable electronic device by charging a battery of the portable electronic device. 3. The solar power package of claim 1, further comprising an accessory battery, wherein: the power charger is further operable to charge the accessory battery with the derived solar power; and the accessory battery is operable to provide the derived solar power to the portable electronic device. 4. The solar power package of claim 1, further comprising an accessory battery and wherein the power charger is further operable to concurrently: provide a first portion of the derived solar power to the portable electronic device; and charge the accessory battery with a second portion of the derived solar power. 5. The solar power package of claim 1, wherein at least a portion of the at least one solar cell is removable from the solar power package. 6. The solar power package of claim 1, wherein the solar power package is capable of being plugged into and removed from the portable electronic device. 7. The solar power package of claim 1, wherein the power charger is further operable to be enabled to provide the derived solar power to the portable electronic device based on the status of the package. 8. A method for providing power to a portable electronic device with a solar power package, the method comprising: deriving solar power with the solar power package; determining that the solar power package is coupled to the portable electronic device in a plug-and-play fashion; adjusting the amount of power provided by the solar power package to the portable electronic device based on attributes of the portable electronic device; and providing the derived solar power to the portable electronic device in response to determining that the solar power package is coupled to the portable electronic device. 9. The method of claim 8, wherein the determining further comprises detecting that the derived solar power is appropriate for the portable electronic device. 10. The method of claim 8, wherein the providing the derived solar power comprises: charging a battery of the portable electronic device with the derived solar power. 11. The method of claim 8, further comprising storing the derived solar power in an accessory battery of the solar power package, wherein the providing the derived solar power comprises providing the derived solar power stored in the accessory battery. 12. The method of claim 8, further comprising: determining that the solar power package is not coupled to the portable electronic device; and storing the derived solar power in an accessory battery of the solar power package in response to the determining that the solar power package is not coupled to the portable electronic device. 13. The method of claim 8, wherein the solar power package is external to the portable electronic device. 14. The method of claim 8, wherein the portable electronic device comprises one of a media player, a notebook computer, a tablet computer, a cellular phone, an image processing device, and a handheld computing device. 15. A power package for providing solar power to an external device, the power package comprising: a solar power source operable to derive solar power from solar energy; and an auxiliary battery operable to: be charged with the derived solar power, wherein the amount of derived solar power provided to the auxiliary battery is adjusted based on attributes of the auxiliary battery; and provide the derived solar power to the external device in response to the external device being coupled to the power package in a plug-and-play fashion. 16. The power package of claim 15, wherein the auxiliary battery is further operable to provide the derived solar power to the external device in a plug-and-play fashion. 17. The power package of claim 15, wherein: the auxiliary battery is further operable to provide the derived solar power in response to the external device selecting the power package from at least two power sources; and the at least two power sources comprise at least one power source that provides power via a network connection, a universal serial bus, a Firewire connection, and a telephone line. 18. The power package of claim 15, wherein the auxiliary battery is further operable to charge an external battery of the external device with the derived solar power. 19. The power package of claim 15, wherein the power package is portable. 20. The power package of claim 15, wherein the plug-and-play fashion comprises: automatically detecting that the power package is coupled to the external device; and determining that the derived solar power is appropriate for use in the external device. 21. The power package of claim 15, wherein the auxiliary battery is further operable to concurrently: be charged with a first portion of the derived solar power; and provide a second portion of the derived solar power to the external device. The second patent is US8004113. The same inventors (Wendall Sander and Daniel Warren) plus Aaron Leiba have described the voltage converter through which the solar charger is coupled to the device. The voltage converter is configured to monitor or detect an amount of power drawn by the electronic load at the output of the voltage converter. In response to the monitored power drawn, the controller is configured to control the voltage converter to adjust further output power provided to the electronic load. As a result, the output voltage from the solar power source is maintained within a predetermined range. Referring to FIG. 8A, in this embodiment, portable device 800 includes, a battery charging manager 801 to manage power to be supplied to one or more system components 803. The system components 803 may include major components of a portable electronic device mentioned above. When AC power is available, power manager 801 may draw power directly from the AC power (not shown) to provide power to system components 803. Meanwhile, the power manager 801 may distribute a portion of the AC power to charge or recharge battery 802. When the AC power is not available, the battery charging manager 801 may enable the battery 802 to provide power to system components 803 for operations. In addition, battery charging manager 801 may draw power from a variety of power sources to charge or recharge battery 802, which in turn may be used to provide power to the system components 803 subsequently or substantially concurrently. According to certain embodiments of the invention, various power sources may include power provided from a communication line or media, such as, for example, a network connection 804 (e.g., Ethernet), a USB (universal serial bus) connection 805, or an IEEE 1394 compatible connection 806, also referred to as Firewire), a telephone line (not shown), or a combination of any of these power sources. In addition, the battery charging manager 801 may further draw power from a solar power source 809 having one or more solar cells or arrays, via the auxiliary charger 807 and/or controller 808. In one embodiment, the auxiliary charger 807 and controller 808 may be implemented using some or all of the techniques described above with respect to FIGS. 3-7. According to one embodiment, battery charging manager 801 is configured to determine the statuses of various power sources 805-806 and 809, as well as other power sources (not shown). Based on the statuses of the power sources, the battery charging manger 801 may select one or more of the power sources, individually or substantially concurrently, to charge the battery 802. In addition, controller 808 may communicate with one or more system components 803 to further enhance the solar power charging techniques based on the operating environment or statuses of the system components 803. Further, portable device 800 may include battery level indicator 810 for indicating a current battery level to a user. Other configurations may exist. Apple are clearly developing an IP portfolio to cover the use of solar power as a means for topping up the power to their i-phones and other portable electronic devices. This is an area that is very competitive especially because many regions in the world do not have ready access to AC power for recharging such devices. Solar power is seen as one of the key solutions to this problem. Many third party devices are available for doing this and Apple may well be trying to restrict the use of these third party devices for plug and play solar recharging. The potential for flexible printed solar cells is clear, future phones could have screens or back panels that also function as solar cells. Flexible panels could be rolled or fanned out from the phone to increase the surface area for power generation.